Well, 2016 was certainly an interesting year for the expanding Earth theory. There were new web resources to explore from James Maxlow, The Natural Philosophy Society and the Friends of Klaus Vogel. The scientific press announced a number of “recent discoveries”: Pluto’s moon was expanding, the Earth’s ancient atmosphere was thinner and the Earth’s ancient continents were always connected... all predicted years ago by Earth expansion. Articles discussing Earth expansion appeared in the Journal of Applied Geology, Geophysics and Geosciences Research, and towards the end of the year two more appeared in the journals of The Geological Society of London and the Australian Institute of Geoscientists. The year started with a final farewell to an expanding Earth globe maker. The previous year had ended with the sad news that Klaus Vogel had passed away. He is well-known for his expanding Earth reconstructions and a friend to many. Carl Strutinski posted an obituary for him at the start of 2016. Klaus Vogel is particularly famous for his globe-in-globe reconstuctions that clearly show how expansion is radial. He published various papers about his reconstructions in the scientific press and it is pleasing to see these starting to become available on the internet. A typical example is this paper published in the Frontiers of Fundamental Physics in 1994. No doubt more will appear in the future. By February there was a great new web based resource provided by James Maxlow, the Australian geologist. There’s hours of interesting information to explore. John Eichler also completed a stimulating PhD thesis investigating three little-known scientific concepts, each put forth by a well-known, respected scientist. The final case study examined is Earth expansion as presented by the Australian geologist Prof. S. Warren Carey. Unlike many papers discussing this concept, the author also describes some of the continuing research into the expansion concept. The thesis is available as a free pdf. 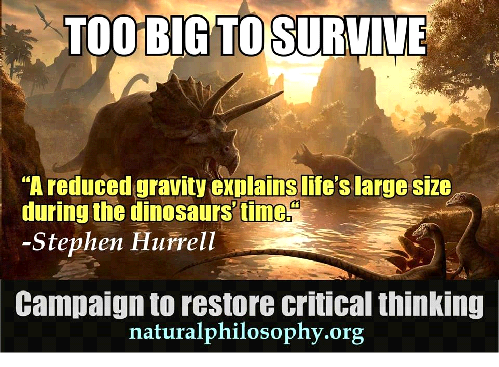 The naturalphilosophy.org society was relaunched and palaeogravity was highlighted as one of the scientific areas needing further research with this advertisement. By March the friends of Klaus Vogel had decided one of the best ways to remember him was to launch a new web site. The new site contained many interesting articles and files about the Expanding Earth in German and English. Also in March a new Google Play version of my book Dinosaurs and the Expanding Earth was released to complement the Hardback and Kindle versions already available. Astronomers were astonished to find that Pluto's moon Charon was bursting at the seams and this was widely reported in the scientific press. A typical article was: Moons can get stretch marks, too. Apparently “The moon expanded in its past, and - like Bruce Banner tearing his shirt as he becomes the Incredible Hulk - Charon’s surface fractured as it stretched.” The expansion was no surprise to anyone who had studied the evidence for Earth expansion. In May the scientific press also announced that scientists had just discovered evidence that the ancient atmosphere was thinner. One of the more obvious predictions of the Expanding Earth Theory is that the ancient atmosphere should have been thinner on an ancient Earth since it has been increasing in size, mass and gravity. I had predicted in my book that “the atmospheric pressure about 400 million years ago was probably between one tenth to one third the present pressure due to the Reduced Gravity Earth”. It was nice to see that prediction confirmed. Another discovery announced in the scientific press was a long-lived connection between southern Siberia and northern Laurentia in the Proterozoic. Plate tectonic theory of course predicts that these two land masses were not connected at that time. In June, Carl Strutinski, a German-Romanian geologist, looked at the Lilliput Effect, reduced gravity and mass extinctions. Those of us who have studied ancient gravity in detail generally agree the evidence indicates gravity was much less in the geological past. However, one area of debate amongst us has been whether this increase in gravity has been continuous or intermittent and all that implies for the rest of science. I had previously reported in 2014 about the "call to arms" by opponents of Earth expansion on Wikipedia. Present-day geologists, who are considered to be the leaders in this field by their peers, are routinely deleted within minutes. In June I once again noted how Wikipedia editors had continued this campaign by deliberately deleting the page describing the work of the celebrated German scientist Ott Christoph Hilgenberg, one of the founders of the expanding Earth theory. In July there was the publication of a fascinating science paper in the Journal of the International Dragonfly Fund, The seven “oddities” of Pacific Odonata biogeography, by Milen Marinov. This discussed some of the problems of the dispersal of ancient insects like the dragonfly around the Pacific Ocean. Plate Tectonics theory predicts that the ancient Pacific should have been nearly twice as large as today’s Pacific Ocean. Since the ancient Pacific would have been much larger than the present day Pacific it would seem virtually impossible for life to have migrated across this vast ocean. Yet the opposite is true, ancient life seems to have found it very easy to transverse what should have been a vast ocean. One answer to this migration problem may be simply that the Pacific wasn’t larger than present. It was smaller. By August there was another geological science paper in the Journal of Applied Geology and Geophysics (IOSR-JAGG). This discussed the geological evidence that the northern boundary of the Indian plate had never been widely separated from the Tibet region. The authors concluded that several lines of geological evidence indicate “the envisaged movement of the Indian landmass is untenable”, even though this movement is essential for the Plate Tectonic theory. They proposed that the answer to this paradox is that the Earth was a smaller diameter in the past as suggested by the expanding Earth theory. By the end of August it seemed that just like buses, new science papers discussing the expanding Earth theory were starting to arrive together. After the recent papers discussing some of the detailed geological evidence indicating Earth expansion, James Maxlow released an important new paper, Modelling Modern Global Geodata on an Ancient Earth. The main point highlighted in Maxlow’s new paper was the predictability of Expansion Tectonics (as Maxlow calls his expanding Earth research) compared to Plate Tectonics. He noted that “conventional plate tectonics considers that continental and seafloor crustal development has been a random, non-predictive, and somewhat catastrophic process”. In comparison Expansion Tectonics is highly predicable. In October there was a new paper about dinosaurs and Earth expansion. New dinosaur discoveries are increasingly highlighting the mystery of their obscure migration routes across the ancient world. It is often difficult to imagine how dinosaurs could migrate at all. When the routes are plotted on orthodox Plate Tectonic reconstructions they sometimes disappear at the edge of a continental plate, only to reappear on another continental plate supposedly separated by a vast ancient ocean. By the end of October I had decided there were so many science papers and books being published about the expanding Earth I needed to split my index into 5 year sections with a new 2015 Onwards Section. In November the Geological Society published a new geoscience paper, History of a discussion: selected aspects of the Earth expansion v. plate tectonics theories, by Stefan Cwojdzinski. The Geological Society is the recognised UK professional body for Geoscientists and Cwojdziński’s new Earth expansion paper is freely available to its 11,500 professional geoscience members. Professor Cwojdziński’s new paper takes us from the history of continental drift through to plate tectonics and explains how this is really a hypothesis for a non-expanding Earth. Plate tectonics theory has to consume oceanic crust in the so-called subduction zones to compensate for the growth of the Earth. The process of the widening of new oceans, such as the Atlantic, Arctic and Indian oceans, should be simultaneous with the shrinking of the Palaeo-Pacific Ocean. If it is not compensated for then the Earth will increase in size. If the Pacific Ocean expands, then the expansion of the Earth is inevitable. There was also another new geological science paper, published in the November 2016 issue of Geosciences Research, which again challenged one of the key principles of plate tectonics. The new study presents geological evidence that there was never an ancient gigantic ocean between India and Asia. Right at the end of the year the Australian Institute of Geoscientists published an article about Earth expansion, written by Dr James Maxlow, the Australian geologist. I’ve missed all sorts of events in this short review of 2016 but you can see what I’ve missed by scrolling down the Facebook page or Twitter feeds. 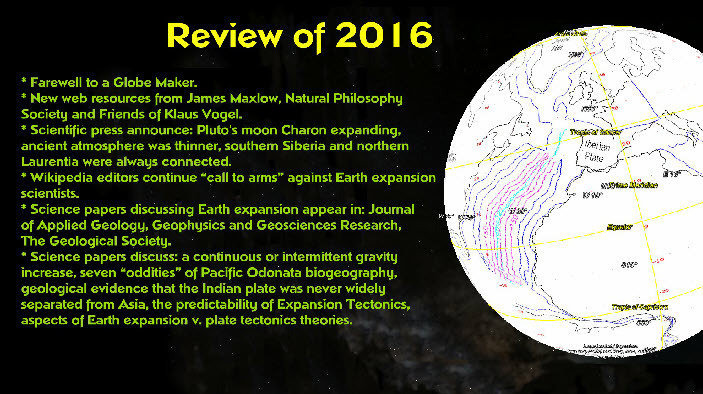 When I reviewed 2015 last year I said that “all in all it's been a good year for Earth expansion” and predicted that “it should be an interesting 2016!” I only put the 2015 review on Facebook but you should be able to read it again if you are on Facebook. Looking back at 2016 I’d say that the reality has been even better than my prediction. It looks like it’s going to be an even more interesting 2017! How did life migrate across the ancient Pacific? Was there an ancient ocean between India and Asia?